This PTO Seal Shield is used on many Massey models with single speed PTO, including; (165UK Engine Serial number 144682 and up), (230 Rear Axle Serial Number FD101, CD8020 and up), 231, 231S, (235 Transmission Serial Number FD101 and up), 240 up to Engine Serial Number P38370), 245, 250, (253 up to Engine Serial P38370), (255 Wet Brakes), 282, 283, )283 Brazil up to Serial Number 2915), 290, (360, 375, 383, 390, 390T up to Engine Serial Number P38370), 670, 690, 698, 699, (20 Rear Axle Serial Number FD101, CD8028 and up), 20C, 20D, 20E, (20F up to Serial Number 5101D0782), (30 Wet Brakes), 30B, 30D, 30E, (31 Rear Axle Serial Number FD101, CD8020 and up), (40 Wet Brakes), 40B, 40E, 50C, 50D, 50E. Replaces 533183M1. Verify Part Number before ordering. New, aftermarket PTO Seal Shield for sale with a solid manufacturer warranty. In addition, we have a generous 30-day return policy if this Massey Ferguson PTO Seal Shield for Massey Ferguson 6480, 670, 675, 690, 698, 698T, 699 tractors needs to be returned for any reason. Please see our Parts Warranty and Return Policy links on your left for complete details before returning. Delivery is via UPS Ground or USPS Priority and usually takes 3-5 business days. The shipping charge will be displayed in your online shopping cart. 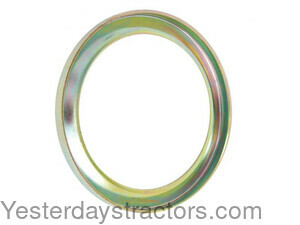 To purchase this pto seal shield, click the "Add to Cart" button or call toll-free 800-853-2651.